Hawk Cottage is a new barn conversion which was finished off for the 2016 season. 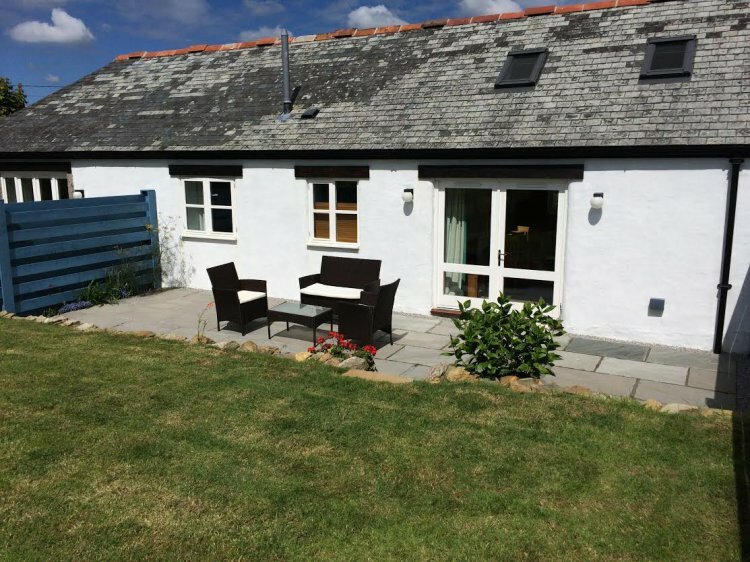 Situated near Gweek, just two miles from Helston, it is ideally located for exploring the Lizard Peninsula while still giving easy access to the rest of West Cornwall including Falmouth, Penzance, St Ives and Land's End. Entering through the front door, you will note the cottage is furnished to a high standard. There's an open plan lounge, kitchen dining area with feature vaulted ceiling. The kitchen area includes an electric oven and ceramic hob, fridge with ice box, slim line dishwasher and microwave. The lounge has a 2 seater sofa and an arm chairs, LCD TV with built-in freeview and a DVD player and freeview. Double doors open up to your private patio and garden area with a gate to the field behind, which you can explore. Please note there is one step leading from the hall to this area. There's a double room with 4'6'' double bed, bedside tables and lamps, dressing table and wardrobe. Single room with 3' single bed, bedside table and lamp and wardrobe. Bathroom with bath, matching toilet and handbasin with separate shower cubicle and powerful mixer shower and a heated towel rail. Hawk Cottage is centrally heated and has its own parking space. Garden furniture is provided and electricity, heating and Wifi are all included in the price. Being close to the public viewing enclosure at RNAS Culdrose you may well see and hear the helicopters as they land and take off. However they generally exercise over the coast and rarely fly at night. Also on site and attached to this property is 'Merlin Cottage' (See property 541). The owners live in a detached house across the courtyard and are available if needed.